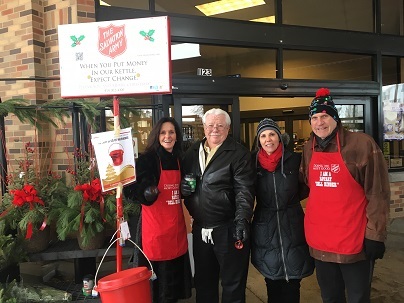 Done-in-a-Day’s longest running and most popular volunteer opportunity is back again this year – ring bells for the Salvation Army on Saturday, December 8th. Sign up for an hour-long time slot between 9am to 3pm, at either the Shorewood Metro Market or the Downtown Metro Market. Email Rita for available times! Join us at our next Done-in-a-Day volunteer opportunity at Feeding America Eastern Wisconsin to help sort food for those in need in our community. ROOT (Restoring Our Outdoor Treasures): Come get your hands dirty and help us restore our outdoor treasures together – and check on those lovely trees many of us helped plant back in the spring! Help replace invasive species with native plants, trail maintenance, erosion control, and more. Most often we will be outside, so come prepared to go out and dress for the weather. As part of this program, volunteers work outside to restore and preserve the Milwaukee Rotary Centennial Arboretum’s natural habitat. Your efforts, combined with hundreds of other volunteers, help make the natural land surrounding the Center the thriving place that it is today. The Arboretum is a healthy habitat for its native plants and animals, an educational resource for our members, urban students and summer campers, and a welcoming green space for all Milwaukee residents. ROOT volunteer work does require volunteers to be able to kneel, bend and walk on uneven terrain. If there are any members of your group who have physical limitations, please let us know ahead of time so that we can do our best to accommodate them. All of the tools necessary to complete the projects will be provided by the Center. This volunteer experience will take place outside. We ask that your group members dress for the weather, wear closed-toed shoes, and bring anything else that they need to be comfortable outdoors (hat, sunglasses, sunscreen, insect repellant). We encourage individuals to bring their own reusable bottles which they can refill at our drinking fountain. This is a small gesture that volunteers and your company can do to help the Urban Ecology Center reach our low impact and sustainability goals. The Urban Ecology Center is fortunate to have a free parking lot for the staff, visitors, and volunteers who drive to the Center. Out of respect for our residential neighbors’ limited street parking, we ask that your group members park in this lot unless it is full. It is located off of East Park Place, just past (west) of the Center building on the opposite side of the street. In the event of inclement weather we may need to modify, shorten, reschedule or cancel the project. We can be in communication if the weather is questionable. Plant trees with us at the Milwaukee Rotary Centennial Arboretum on May 12th! Rotary International President Ian H.S. Riseley declared that protecting the environment and curbing climate change are essential to Rotary’s goal of sustainable service. In response, he challenged every Rotary club to make a difference by planting a tree for each of its members before Earth Day on April 22, 2018. Rotary International hopes that the 1.2 million new trees planted by members will have a lasting impact on our planet. Our club will plant 375 trees in the Milwaukee Rotary Centennial Arboretum to represent each of our members. We hope that all of you will come out and help us! The Urban Ecology Center will provide all necessary equipment – including gardening gloves – unless you’d rather use your own. Boots (hiking boots, heavy shoes) would be recommended and proper clothing if it is raining. Plant trees with us at the Milwaukee Rotary Centennial Arboretum on May 5th! Come volunteer and have a blast at the 23rd Annual Milwaukee Riverkeeper Spring Cleanup! This spring, be one of nearly 4,000 volunteers joining together across the Milwaukee River Basin to pick up over 100,000 pounds of trash, get outdoors, and help us achieve swimmable, fishable rivers. Milwaukee Riverkeeper provides the gloves, trash bags, and amazing FREE T-SHIRTS. YOU provide the hands and energy to pick up the interesting and sometimes bizarre trash that finds its way into our beautiful river system. Join us at afterwards at Estabrook Park for our FREE celebration with Rock the Green! Show Us Your Trash Contest! Take a picture of any unique or unusual item(s) you find during the Spring Cleanup! Post your photo(s) to any one of Milwaukee Riverkeeper’s social media channels. Include the hashtags #MRKCleanup23 #ShowUsYourTrash in the photo post. Posting your photo(s) and using the the hashtags automatically enters you to win! Become a Riverkeeper Rockstar by raising additional funds for Milwaukee Riverkeeper! Help Milwaukee Riverkeeper raise additional funds by soliciting pledges for the bags of trash you collect (see form attached), or set up a fundraiser on Facebook, and let your friends know you’re raising funds for Milwaukee Riverkeeper (see attached instructions)! Join us at New Threads of Hope from 9:00 am to 12:00 pm to remove labels from clothes, so they can be donated to those in the city who need them.